Today is the Feast Day of the Holy Innocents, the day we remember the massacre of the children of Bethlehem by the army of an empire that was threatened by the birth of a child. To escape the violence, Mary and Joseph took Jesus to Egypt, where they lived until Herod died. Despite all the turmoil there, Egypt today continues to be a refuge for families fleeing political violence. 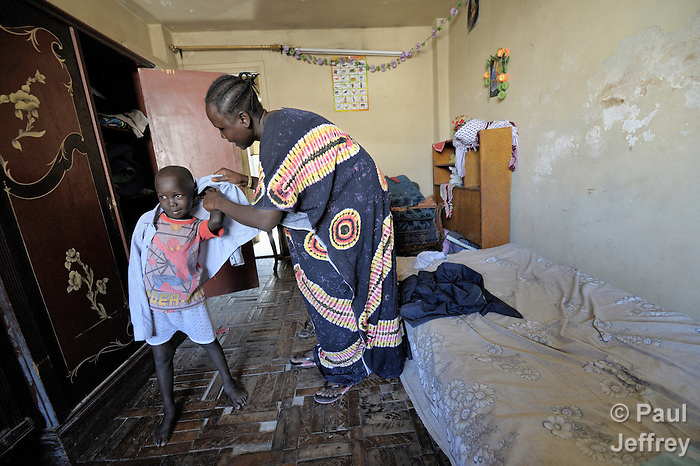 Heres an image of Mery Deng Makwi as she helps her 5-year old son Riko get dressed for school in their apartment in the Abbasia neighborhood of Cairo. The entire family fled fighting in southern Sudan a decade ago. Riko and his two siblings go to a school funded by the United Nations. Theyd like to go back home, but Khartoums decision to continue the war against newly independent South Sudan doesnt make that a very appealing prospect. The massacre of the innocents goes on unabated, and families continue to flee their homes in a search for safe refuge. December 28, 2011 | Filed under Picture of the Week.